In the following I will investigate the New Age guru Deepak Chopra, seen in relation with American New Age propaganda. Reviewing Susan Jacoby's book, The Age of American Unreason, Wendy Kaminer sees Deepak Chopra's popular reception in the USA as being symptomatic of many Americans' historical inability (as Jacoby puts it) "to distinguish between real scientists and those who peddled theories in the guise of science". This historical inability is the reason for the rise of New Age propaganda sites such as Gaia.com, which influence is enormous, also outside the borders of America. How, given the recent and sorry story of ideologically motivated conceptions of knowledge – Lysenkoism in Stalin´s Soviet Union, for example, or Nazi critiques of “Jewish science” – could it again have become acceptable to behave in this way? But the reason is American´s historical inability. They haven´t experienced being slaves under totalitarian ideologies such as National socialism and Communism. Chopra's "nonsensical references to quantum physics" are placed in a similar lineage of American religious pseudoscience, extending back through Scientology to Christian Science. Physics professor Chad Orzel has written that "to a physicist, Chopra's babble about 'energy fields' and 'congealing quantum soup' presents as utter gibberish", but that Chopra makes enough references to technical terminology to convince non-scientists that he understands physics. Chopra has especially been criticized for his frequent references to the relationship of quantum mechanics to healing processes, a connection that has drawn skepticism from physicists who say it can be considered as contributing to the general confusion in the popular press regarding quantum measurement, decoherence and the Heisenberg uncertainty principle. In 1998, Chopra was awarded the satirical Ig Nobel Prize in physics for "his unique interpretation of quantum physics as it applies to life, liberty, and the pursuit of economic happiness". When interviewed by ethologist and evolutionary biologist Richard Dawkins (whom I will return to) in the Channel 4 (UK) documentary The Enemies of Reason, Chopra said that he used the term "quantum physics" as "a metaphor" and that it had little to do with quantum theory in physics. Deepak Chopra is the man behind my concept of Postmodern Spirituality. In my article Constructivism: The Postmodern Intellectualism behind New Age and the Self-help Industry I have explained how New Age has linked spirituality to postmodernism. This new language accepts the use of thought distortions (see my book A Dictionary of Thought Distortions). Postmodern intellectualists are, through this use of language, often trying to get a political agenda forced through. If you change the political terms with spiritual terms, though, the same language is used in New Age circles. As an example is precisely Deepak Chopra, who has invented the concept of quantum healing, which again is based on the misunderstanding of quantum mechanics, that the mind can control everything. Chopra is without hesitation going into discussions with experts, and is precisely using the above-mentioned language. On ABC's Nightline in March 2010 Deepak Chopra entered a week-long debate against arch atheist Dr. Michael Shermer. The debate was organized as a part of Nightline's "Face Off" event series, and was incited by a public challenge issued by Chopra. In the final days, the debate gravitated around whether spiritual experiences should be explained in material or immaterial terms. Eventually, the debaters could not agree on the issue of whether such experiences originate within the body or outside of it (see my article Quantum Mysticism and Its Web of Lies and the updates in Quantum Mysticism). In my article The Sokal Hoax you can read more about this development. Susan Jacoby's new book The Age of American Unreason might be viewed as a kind of sequel to Richard Hofstadter's 1963 classic, “Anti-Intellectualism in American Life.” A cultural history of the last forty years, The Age of American Unreason focuses on the convergence of social forces—usually treated as separate entities—that has created a perfect storm of anti-rationalism. These include the upsurge of religious fundamentalism, with more political power today than ever before; the failure of public education to create an informed citizenry; and the triumph of video over print culture. Sparing neither the right nor the left, Jacoby asserts that Americans today have embraced a universe of “junk thought” that makes almost no effort to separate fact from opinion. Combining historical analysis with contemporary observation, Susan Jacoby dissects a new American cultural phenomenon - one that is at odds with the American heritage of Enlightenment reason and with modern, secular knowledge and science. With mordant wit, she surveys an anti-rationalist landscape extending from pop culture to a pseudo-intellectual universe of "junk thought." Disdain for logic and evidence defines a pervasive malaise fostered by the mass media, triumphalist religious fundamentalism, mediocre public education, a dearth of fair-minded public intellectuals on the right and the left, and, above all, a lazy and credulous public. Jacoby offers an unsparing indictment of the American addiction to infotainment--from television to the Web--and cites this toxic dependency as the major element distinguishing the current age of unreason from earlier outbreaks of American anti-intellectualism and anti-rationalism. With reading on the decline and scientific and historical illiteracy on the rise, an increasingly ignorant public square is dominated by debased media-driven language and received opinion. At this critical political juncture, nothing could be more important than recognizing the "overarching crisis of memory and knowledge" described in this impassioned, tough-minded book, which challenges Americans to face the painful truth about what the flights from reason has cost them as individuals and as a nation (see my entry on Anti-intellectualism and Anti-science). Jacoby rightly identifies ­pseudo­science and religion as two “critical ingredients” of unreason since then. Indeed, they often work in tandem: The “sciences” of mind cure and New Thought flourished, and Mary Baker Eddy “discovered” Christian Science in the 1860s. Then came Scientology, the “science” of positive thinking, and, more recently, New Age healer Deepak Chopra’s nonsensical references to quantum ­physics. Jacobi is a part of the Skeptic movement with Richard Dawkins as a front figure, and she fails to see the pseudoscience of this movement, which is based on reductionism. The first version for example claims that Man fully can be described and explained with the methods of natural science. This happens in various forms of Naturalism, Positivism and Behaviourism. It is clear that this first kind of reductionism (scientism and pseudoskepticism) are more accepted than the second openly anti-scientific version. The second version claims, that psychology, sociology or history can give the total and superior understanding of, what a human being is. These viewpoints are described respectively as Psychologism, Sociologism and Historism. It is particular this version which openly claims to be a supporter of anti-science, and accuses the other part of being reductionistic, and demand so-called alternative sciences. This is what we see in the popular culture of New Age. ​But both sides are examples of reductionism and are therefore examples of pseudoscience. Paul Kurtz, an American skeptic and secular humanist, has written that the popularity of Chopra's views is associated with increasing anti-scientific attitudes in society, and such popularity represents an assault on the objectivity of science itself by seeking new, alternative forms of validation for ideas. Kurtz says that medical claims must always be submitted to open-minded but proper scrutiny, and that skepticism "has its work cut out for it". In 2013, Chopra published an article on what he saw as "skepticism" at work in Wikipedia, arguing that a "stubborn band of militant skeptics" were editing articles to prevent what he believes would be a fair representation of the views of such figures as Rupert Sheldrake, an author, lecturer, and researcher in parapsychology. The result, Chopra argued, was that the encyclopedia's readers were denied the opportunity to read of attempts to "expand science beyond its conventional boundaries". The biologist Jerry Coyne responded, saying that it was instead Chopra who was losing out as his views were being "exposed as a lot of scientifically-sounding psychobabble". More broadly, Chopra has attacked skepticism as a whole, writing in The Huffington Post that "No skeptic, to my knowledge, ever made a major scientific discovery or advanced the welfare of others." Astronomer Phil Plait said this statement trembled "on the very edge of being a blatant and gross lie", listing Carl Sagan, Richard Feynman, Stephen Jay Gould, and Edward Jenner among the "thousands of scientists [who] are skeptics", who he said were counterexamples to Chopra's statement. By the way, which major scientific discoveries have Chopra himself made? Besides claiming that he and his fellow Matrix Sophists have made such, and that they will be proved in the future? He hasn´t discovered quantum physics. Quantum physics was discovered by using the same objective scientific principles, which are behind all other major scientific discoveries; the very same scientific principles which Chopra is attacking as examples of “old thinking.” But Chopra doesn´t even understand this simple contradiction. Chopra calls his own alternative science for “speculative science.” In reality it is bad philosophy. Bad philosophy is never going to be “proved”. It´s going to be debunked. The ideas Chopra promotes have been regularly criticized by medical and scientific professionals as pseudoscience. This criticism has been described as ranging "from dismissive [to] damning". For example, Robert Carroll states Chopra attempts to integrate Ayurveda with quantum mechanics to justify his teachings. Chopra argues that what he calls "quantum healing" cures any manner of ailments, including cancer, through effects that he claims are literally based on the same principles as quantum mechanics. This has led physicists to object to his use of the term quantum in reference to medical conditions and the human body. His treatments benefit from the placebo response, and some argue that his claims for the effectiveness of alternative medicine can lure sick people away from medical treatments. He is placed by David Gorski among the "quacks", "cranks" and "purveyors of woo", and described as "arrogantly obstinate". Richard Dawkins publicly exposed Chopra, accusing him of using "quantum jargon as plausible-sounding hocus pocus". But Richard Dawkins is himself a reductionist and therefore a pseudoscientist advocating his atheistic version of Social Darwinism. In connection with The Matrix Conspiracy Fascism I have used Richard Dawkins and Ken Wilber to show two versions of social Darwinism, which I claim is two sides of the same Matrix Coin. I use them because they are probably the most known and respected persons. Both Dawkins and Wilber are, as Social Darwinists, ending up in reductionism. I won´t go into an explanation here, but refer to my two articles on them: A Critique of Richard Dawkins and the Committee for Skeptical Inquiry (CSI) and A Critique of Ken Wilber and His Integral Method. Also see my entry The Matrix Conspiracy Fascism. 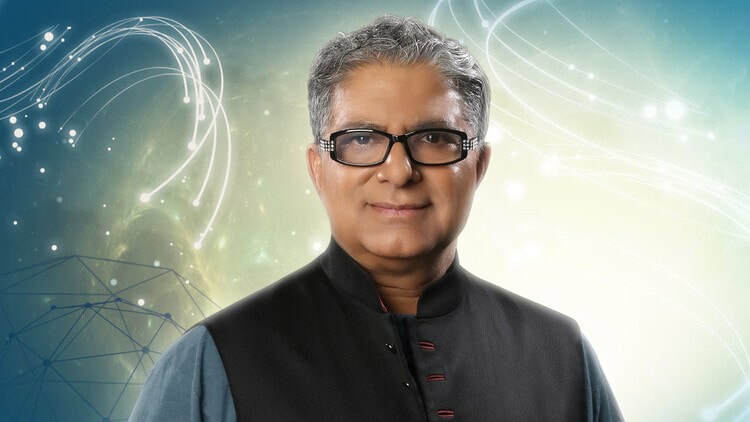 Deepak Chopra is also an advocate of the “evolution of consciousness.” Chopra speaks and writes regularly about metaphysics, including the study of consciousness and Vedanta philosophy. He is a philosophical idealist, arguing for the primacy of consciousness over matter and for teleology and intelligence in nature – that mind, or "dynamically active consciousness", is a fundamental feature of the universe (see my The Matrix Conspiracy Updates about how philosophical idealism is the background for the so-called Simulation theory). In this view, consciousness is both subject and object. It is consciousness, he writes, that creates reality; we are not "physical machines that have somehow learned to think...[but] thoughts that have learned to create a physical machine". He argues that the evolution of species is the evolution of consciousness seeking to express itself as multiple observers; the universe experiences itself through our brains: "We are the eyes of the universe looking at itself". He has been quoted as saying "Charles Darwin was wrong. Consciousness is key to evolution and we will soon prove that." He opposes reductionist thinking in science and medicine, arguing that we can trace the physical structure of the body down to the molecular level and still have no explanation for beliefs, desires, memory and creativity. But as with other New Agers he doesn´t understand reductionism, since he himself is a blatant reductionist. In his book Quantum Healing, Chopra stated the conclusion that quantum entanglement links everything in the Universe, and therefore it must create consciousness. Chopra argues that everything that happens in the mind and brain is physically represented elsewhere in the body, with mental states (thoughts, feelings, perceptions and memories) directly influencing physiology by means of neurotransmitters such as dopamine, oxytocin and serotonin. He has stated, "Your mind, your body and your consciousness – which is your spirit – and your social interactions, your personal relationships, your environment, how you deal with the environment, and your biology are all inextricably woven into a single process … By influencing one, you influence everything." That is: a form of quantum biology, and therefore a reductionism. Chopra's claims of quantum healing have attracted controversy due to what has been described as a "systematic misinterpretation" of modern physics. Chopra's connections between quantum mechanics and alternative medicine are widely regarded in the scientific community as being invalid. The main criticism revolves around the fact that macroscopic objects are too large to exhibit inherently quantum properties like interference and wave function collapse. Most literature on quantum healing is almost entirely theosophical, omitting the rigorous mathematics that makes quantum electrodynamics possible (see my article The Fascism of Theosophy). Chopra has been described as "America's most prominent spokesman for Ayurveda". His treatments benefit from the placebo response (see my entry on Joe Dispenza). Chopra states "The placebo effect is real medicine, because it triggers the body's healing system." Chopra has metaphorically described the AIDS virus as emitting "a sound that lures the DNA to its destruction". The condition can be treated, according to Chopra, with "Ayurveda's primordial sound" Taking issue with this view, medical professor Lawrence Schneiderman has said that ethical issues are raised when alternative medicine is not based on empirical evidence and that, "to put it mildly, Dr. Chopra proposes a treatment and prevention program for AIDS that has no supporting empirical data". He is placed by David Gorski among the "quacks", "cranks" and "purveyors of woo", and described as "arrogantly obstinate". The New York Times in 2013 stated that Deepak Chopra is "the controversial New Age guru and booster of alternative medicine". The Time magazine stated that he is "the poet-prophet of alternative medicine.” He has become one of the best-known and wealthiest figures in the holistic-health movement. The Times argued that his publishers have used his medical degree on the covers of his books as a way to promote the books and buttress their claims. In 1999 Time magazine included Chopra in its list of the 20th century's heroes and icons. The following year Mikhail Gorbachev referred to him as "one of the most lucid and inspired philosophers of our time". Cosmo Landesman wrote in 2005 that Chopra was "hardly a man now, more a lucrative new age brand – the David Beckham of personal/spiritual growth". A 2008 Time magazine article by Ptolemy Tompkins commented that for most of his career Chopra had been a "magnet for criticism", and most of it was from the medical and scientific professionals. Opinions ranged from the "dismissive" to the "outright damning". Chopra's claims for the effectiveness of alternative medicine can, some have argued, lure sick people away from medical treatments. Tompkins however considered Chopra a "beloved" individual whose basic messages centered on "love, health and happiness" had made him rich because of their popular appeal. English professor George O'Hara argues that Chopra exemplifies the need of human beings for meaning and spirit in their lives, and places what he calls Chopra's "sophistries" alongside the emotivism of Oprah Winfrey. It would be better to consult the traditional wisdom traditions, which maybe even are free of charge.